300 Mandirigma is a project of Golden Grip Universal Foundation aiming to raise funds for its mission to provide free education via e-learning, free medical assistance, and modern technology livelihood programs to the foundation’s beneficiaries. The theme 300 Mandirigma is very meaningful to the foundation. It symbolizes the Modern Day Heroes who emerge as victors and winners in their day to day battles in life. One need not to be in a battlefield to say that he has dedicated his life for his family and country. 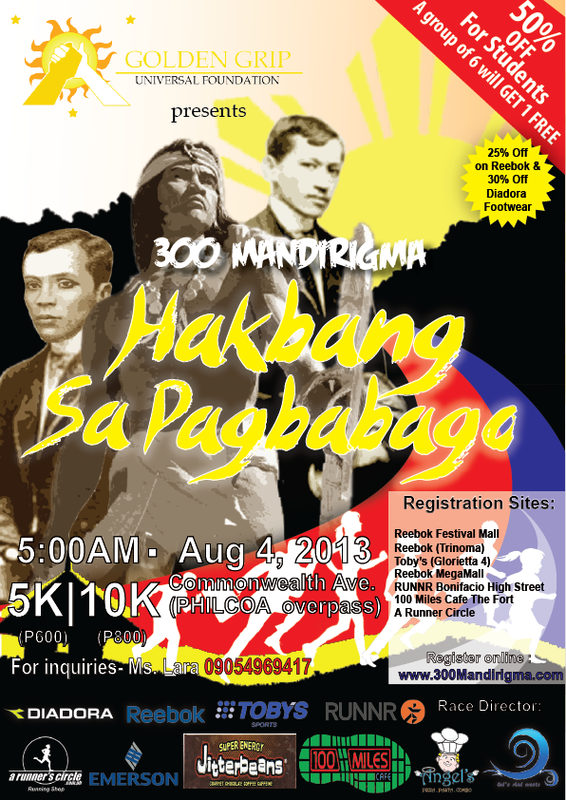 Golden Grip Universal Foundation invites you to join them on Aug.4, 2013 on their first leg of the 300 Mandirigma. Three-leg series The Hakbang sa Pagbabago, a Fun Run event that is going to take place at Philcoa via Commonwealth, Quezon City. Hakbang means a Step.. A Step towards change..
Race kits are available upon registration. Loot bags with freebies will be given on the race day. If you present your race bib to Reebok or Diadora, you may avail of the 25% discount on all REEBOK regular items, shoes, apparel and accessories; 30% discount on all DIADORA Footwear. The 300 Mandirigma Finisher Shirts will be exclusive to the 1st 300 Finishers. 50% of on Registration fees for Students who will present their valid ID upon registration. 6 registrants will get 1 free race kit for non-students who will register in groups.